The UAE region generally has a humid climatic condition throughout the year. Due to high humidity, Dehumidifiers in UAE are a must-have home appliance. Vacker UAE has been working as a supplier of different types of Portable Dehumidifier for different cities in UAE such as Dubai, Abu Dhabi, Sharjah, Ajman, Fujairah, Ras al-Khaimah, Umm al-Quwain, etc. Our company Vacker UAE provides the best types of Portable Dehumidifiers for your homes, schools, offices, etc. 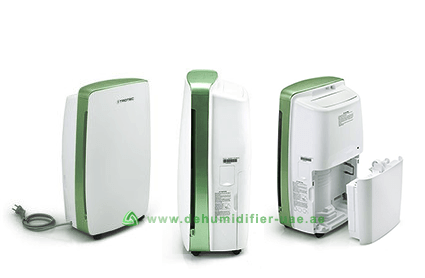 The damp condition of the living space can have a lot of negative effects on our health and property and hence, we supply the best kind of portable dehumidifiers that will make your damp living space go dry in an instant. Our dehumidifiers have gone through many tests during the manufacturing process and are thus capable of performing effectively in every practical condition. We already know that humidity can have many negative effects on our health and property. Excessive humidity creates a sense of irritation and stickiness. Humidity results in the increase of temperature in the living space. This increased temperature creates uncomfortable living and working conditions. High humidity increases the formation of molds on the walls damaging the paints and decorations on it. People suffering from asthma can have respiratory problems in a humid condition. Different kinds of furniture made of wood are also damaged by high humidity. Different pests are also found to prosper in humid conditions. Fungus formation on leather items is also a common sight in high humid conditions. The view through glass windows also is affected due to vapor formation on the glass pane. It is capable of dehumidifying 20 liters of water from the air. It can operate in a wide range of humid conditions which is from 30% RH to 80% RH. The temperature range in which it can operate is 5 degree Celsius to 35 degree Celsius. The air flow rate per hour of the device is 130m³. The device contains automated 4 liter tank and can alarm the user when the tank gets full. It produces very low sound and hence does not create any disturbance in the living space. The sound level produced by the device is only around 43 db. The device is extremely light and can easily be carried from one place to another. It also comes with an auto defrost system.